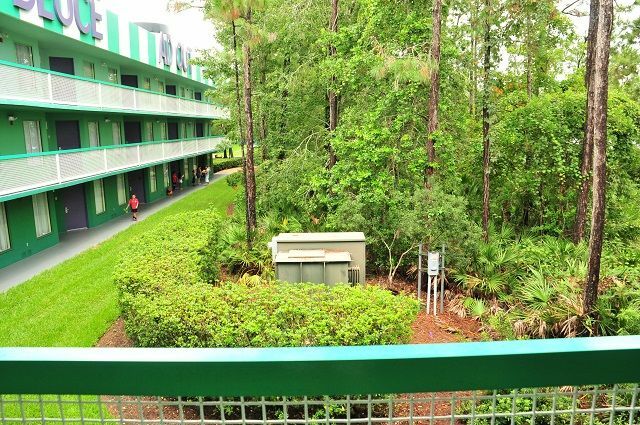 One of the first decisions you’ll have when booking a Disney World hotel room is which view to select. If you’re staying at the Yacht Club, for example, do any Garden View rooms have a view of the Stormalong Bay lazy river? If you’re on the monorail loop, does a Magic Kingdom View really improve your chances of seeing the Wishes fireworks? Is Savannah View at the Animal Kingdom Lodge worth the money? To help you decide, we’ve spent the past year taking pictures of what you’ll see from the window of every Disney World hotel room – more than 30,000 individual photos. 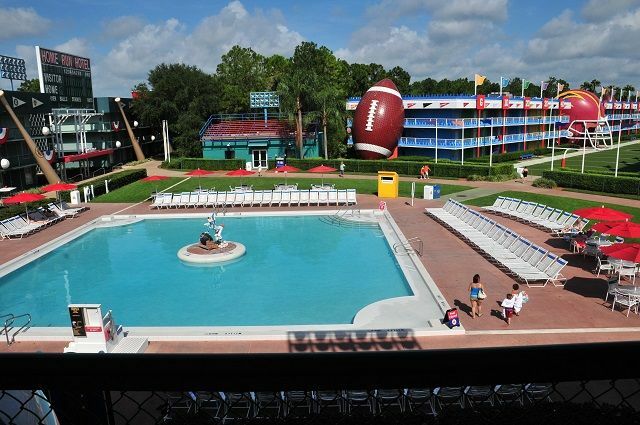 Today we’re giving you a preview of the first resort: Disney’s All-Star Sports Resort. Room Type Includes Disney’s description of the view, and the bed type in the room (if we know it). All-Star Sports has Standard and Preferred views, most with double beds. Moderates will show queen beds, and so on. Our Picks Shows only the rooms which the Unofficial Guide has determined to be the best at the resort. Prices You can also filter by price by entering the date you’re checking in. Set any of these options and click “Show Matching Rooms.” The map will highlight in red all of the buildings which have rooms matching your options. Once you’re looking at a room’s view, you can do a comparison of nearby views by going left or right one room, or up or down one floor. 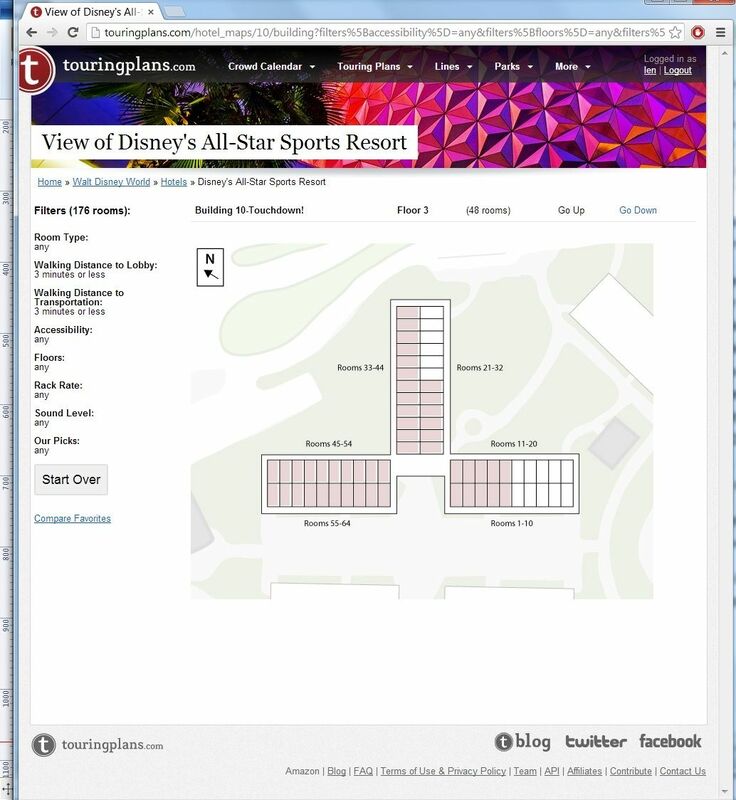 Another really great feature on this page is shown in the green text just below the photo: It’s the exact wording to give Disney (or your travel agent) to request that specific room, and rooms like it if this room isn’t available. During this project we learned that Disney’s reservation system may only have 80 characters of text to make room requests, and we’ve ensured that this text fits in 80 characters or less. While there’s no guarantee that you’ll get the room, by telling Disney the room you want and its alternatives, you increase your chances. 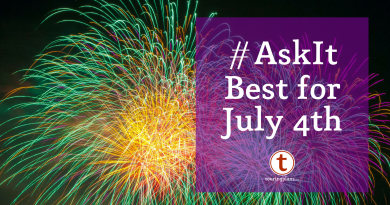 Why is choosing a room important? For one thing, you’re paying a premium to stay on-site. So consider the three photos below, each of which is a room view you could get at random if you just let Disney make the decision for you. Ah, obstructed view seats. Again. Should the first thing your family sees every morning to be a giant grey electrical box? Or a hunk of grey metal support? Wouldn’t it be better to have a sweeping panorama of the pool and resort grounds, where you can brag to your family that you found this exact room just for them? You’re also able to leave public reviews and private notes about a room, rate a room, and mark a room as a “favorite.” When you mark two or more rooms as favorites, you’re able to do a side-by-side comparison of each room’s view by clicking the Compare Favorites link on the left side of the page. 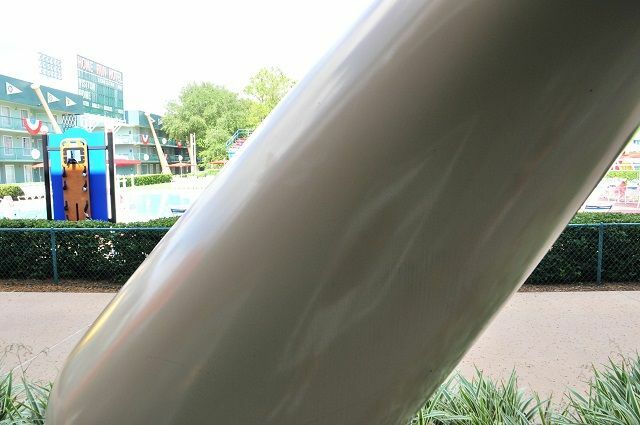 We had a lot of cooperation from Disney executives and resort staff to help collect these photos. For the deluxe and DVC resorts, we’ve got pictures of most of the first-floor rooms at every resort. For upper-floor rooms, we’ve got sample photos from different parts of each wing or building, showing the approximate view you’ll get at each room. And we’ve built into the site the ability for you to upload photos from these rooms, to help out other TouringPlans folks plan their trips. Whether you’re taking a honeymoon or taking the kids on their first trip to Walt Disney World, we’ll help you find the perfect hotel room. Well I positively giggled at the excitement this brings to an OCD planner like myself! Wow. What a project! Thanks for doing this. I second that . what a great project. thank you so much for your hard work and dedication. Will this be a part of the paid premium account, or can anyone access/use it? Thanks! We haven’t decided on whether it’ll be subscription only. One thing we’re considering is tasteful travel agent ads on the views to keep it free. Or we could make it part of the subscription, but less people would use it. I don’t have an opinion either way. Let me know what y’all think. I would be happy as a travel agent to support that if the rates were something I could manage! What an amazing project – thank you!!! I would be happy either way; I can see valid arguments for subscription-only or advertisements. Thank you so much for the research and detail, something the books and this website does better than anyone else, no contest. Agree totally. Charge for it please! I think it should be part of the subscription, especially when the subscription price is quite reasonable. However, I wouldn’t be offended if it were ad-supported. BTW, this is going to be a FABULOUS feature! Thanks for all you and your team does. I agree with others here that it should be part of the subscription. Great work! I’m a subscriber and will continue to be one, so I’ll see it either way. The only question I have is if it is as popular as I think it will be and there are tons of people on it, will it function well? If it slows response time down, then I would say make it paid to help support your additional support to keep the site running well. Subscription for sure. This is wonderful information and I am a subscriber, but I think people will join just to get this info. Honestly, this is WAAAAAY more valuable information than wait times and crowd calendars for me. This is just what I’ve been waiting for on a Disney site. Please keep it free cause Touring Plans is awesome! I certainly think it is worth being part of the subscription though would be equally happy with some sort of ads as long as it keeps the clean look that the TouringPlans website has developed over the years. Subscription, for the real fans of the site! if you don’t think it’s enough of an incentive to sign up for your plan (or if you could get comparable revenue ads) I’d say put it free with ads for everyone, but no ads for members. This is FANTASTIC! Thank YOU!!!! What a resource this will be. Awesome! Wow! This is amazing! What a great idea. You continue to make me be a proud subscriber and supporter of you guys! Wow! Love this! thank you! This is fantastic! A great addition to the product. Looking forward to doing some exploring! Michael, They could’ve just taken a photo of the room number they were standing in front of before they took the picture of the view from that room. Wow! This is extremely cool. I can’t decide whether Google or Disney will be first in line to buy you out. Just understanding the logistics of putting this together would be interesting to me. Thank you for all the hard work! This will be an excellent tool for my clients to use! Wow. You guys are absolutely crazy. But this is incredible. Len, this sounds like it was your idea. Looks great! Can’t wait to see the other resorts added. 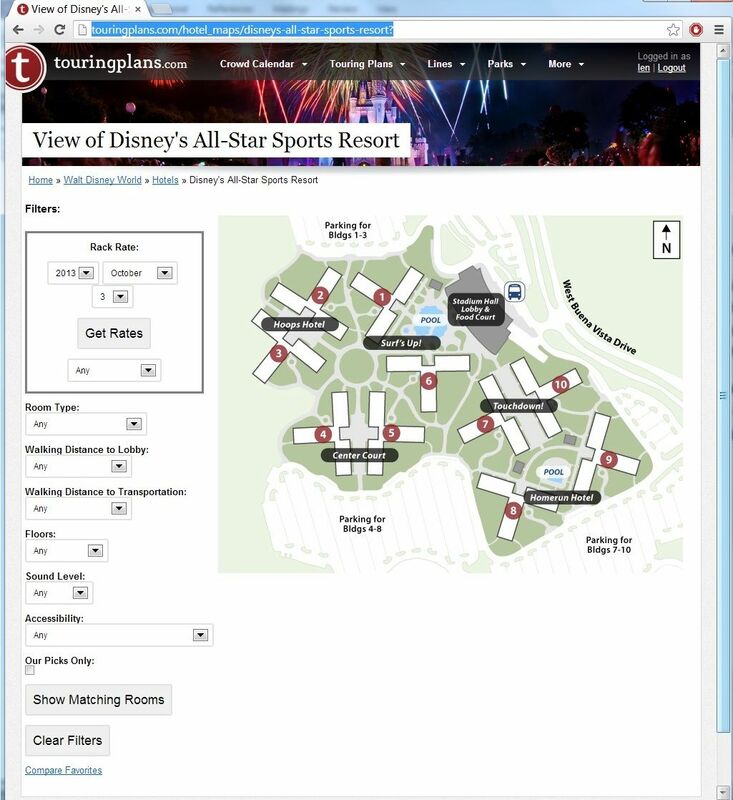 A couple of quick notes though, Once you click on a building to see the highlighted rooms, there is no way back to the map of the whole resort without using the “Start Over” button, and that clears all your filters. Once I set my filters, I may want to compare two buildings. Also, I’m curious about what criteria the Unofficial Guide uses to make the “Our Picks” list. Maybe those could be added to the comments? I certainly don’t want to tell you how to do your job, since you are providing us with a free utility, but I those two things jumped out at me as ways to make a great thing even better. Thanks again for all the work you do to make touring more enjoyable. Oh, good feedback. Thanks. I’ll see what we can do about going back to the whole resort. That should be simple. I think we can add mouse-over text or a link to show the criteria for UG hotel room picks. Thanks for that advice. Oh touringplans.com, you are SO my people! Woot! Len, if I wasn’t already completely sold on my paid subscription… Seriously, this new service is worth the cost alone. I’m in total agreement with Jennifer. I have long wished for a site to offer this! Absolutely brilliant! Thank you for providing such a wonderful resource. This is AWESOME! We’ve already made a room request for our trip in May of 2014, but this will help us pick the exact room we want. So cool!! Very cool! Will the interface indicate whether the image is an actual photo vs a “sample” photo? Yes – we’ll have text on the screen that says it’s close (and we’ll tell you how far it is from the room you’re in). We’ll also give you a way to upload a photo of that room. I figured that you would have this covered, but thought I would ask anyway. 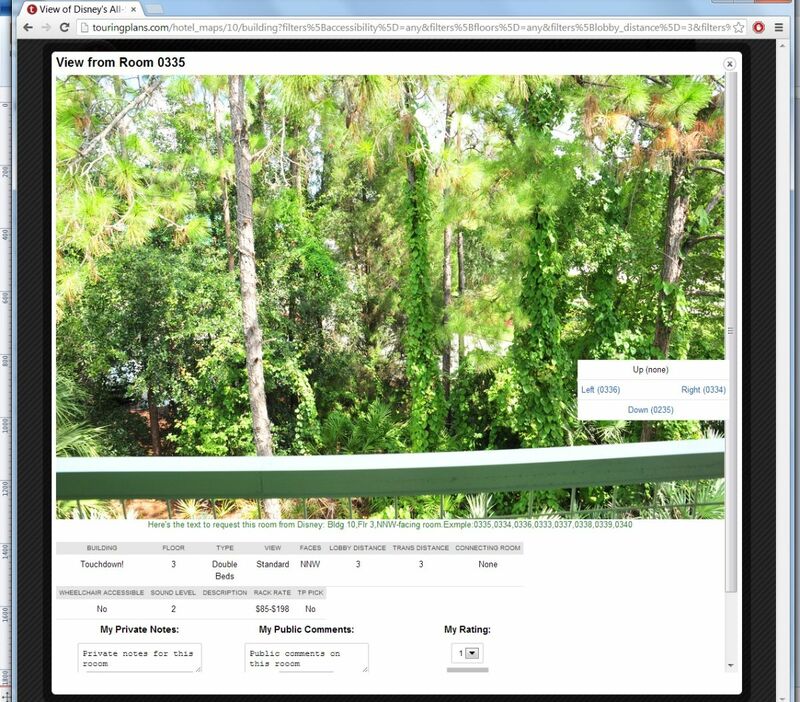 Also, dvcnews.com has a lot of user-uploaded balcony photos from DVC resorts – I don’t know if they would be considered public domain, but that could be another source for you. I LOVE this! What a great idea, and so useful! I have tried so many times to approximate what I’ll see from any given room/building, and the room number that corresponds. This is excellent! Thank you so much! I think that having a few sample photos of each resort be free with the majority of the pictures available to subscribers would add value to the subscription while still keeping those who haven’t yet subscribed happy and may even drive up subscriptions. Let the OCD planning begin! Woo hoo! I’ll see what we can do for those. The GF staff have been super helpful so far. Love this SO much. Futuristically speaking, you could also have updates of what guests actually requested that resulted in this particular room in those public comments. Sort of a how did it compare to your recommended language? Great work!!!! I’m excited to see the wilderness rooms next week for jan 14. I think we could ask folks to tell us whether the text was successful. We’d have to figure out how to compare it to those who didn’t use the text, which may be challenging. I’ll ask the developers to noodle on it. Thanks! I really couldn’t care less about the room view pic (rooms are little more than places to sleep/store my stuff), but the lobby/transportation walking times will be IMMENSELY HELPFUL to me. Excellent! One odd thing we’ve found with, say, Google Maps is that it doesn’t recognize that you can cut through the middle of these buildings, because the first floor center is open. We’ve taken that into account with our times. Good point. We’re open to suggestions. What colors might work better? Green is the first color that comes to mind 🙂 But it would have to be a bright/fluorescent green to stand out, given the background colors. Another option could be to ‘grey out’ the rest of the buildings. Hope it helps! Thank you for all the hard work! I agree, a nice bright green would say, “Go Here!” to me. That, or a yellow, like someone hit it with a highlighter. I love the idea and the distance to the transportation and food court is just amazing. I think this will be a great benefit for folks with walking problems. Can’t wait to use it for our trip next year….thanks for all the work!!! This is amazing! I am not sure how you did it, but this really sets the UG 200% better then any other guide or website. Thank you!!!! This is epic! I’ve been patiently waiting for the roll out since you mentioned this project on WDW Today some time ago. What a fantastic tool! I’ll be checking into BLT in a few days & would be happy to submit photos of our view. Thanks Amy! Yeah, we’d love photos. Send them to len@touringplans for now and I’ll make sure they get added. WOW – this is AMAZING! One bit of feedback – images load VERY slowly. They look amazing but load slowly. I tested my connection speed while browsing: 34.18 Mbps down so it’s not me. Maybe a lower res image on load an option to view higher res? BUt again, AWESOME stuff! Images loading faster now – are they all the same size? Maybe you were just getting tons of traffic earlier to see the awesome! May have been a traffic spike. I’ll keep an eye on it. Thanks for the heads-up. Most of the images are the same size – something like 3600 x 2400 or larger. We may need thumbnails for the smaller images. We’ll see. I’d highly recommend batching these into a couple of sizes. Especially for thumbnails, but even in the detail view, having a quick-loading smaller images is best practices for a fast-loading page that doesn’t drive your bandwidth bills through the roof under heavy load. Users who want the full-size should be able to get them, but perhaps not by default. Yep – we’re going to do different sizes based on platform. Thanks again! This is incredibly awesome and such a lot of work. I would like to say thank you for that! Btw, I would love to hear more about this project in a podcast.. How this came to be, what the challenges are, Disney’s cooperation, the features explained, that sort of stuff. So great. I think your three picture examples here are a great example of how different families would really benefit from this feature. You say that the third pic with the pool view might be the most desirable but I know my family would much rather have the first one. Despite the electrical box, my family would prefer facing away from the crowded (and often loud) pool, and would like the beautiful green view of Florida nature. Thanks Nathan! I was going to use a photo of the trees. The first few I had just didn’t look good scaled down. But there’s lots of greenery to be found at Sports – check out room 3332. Wow Len this is amazing !! I will definitely be using this for my upcoming stay at Bay Lake Tower. As a long time reader,subscriber to lines and listener of the WDW Today podcast I have always used your room suggestions when booking my families stays but this takes it to a whole new level. Thanks for all the work that went into it. Looking forward to seeing the other resorts come online. I cannot tell you how long I have been waiting for something like this. I’ve been trying to figure out which room we had at AKL last trip without much success. But I will definietly know from the photo! Looking forward to the AKL rollout! What an insanely brilliant idea, I love it. Can’t wait for Wilderness Lodge info next week. Honestly. Len Testa = Evil Genius. If this is what surviving on a diet of dole whips and tequila does, maybe I should try it! Stellar job and how convenient for the consumer. When we book our hotel for next fall, we would like 3 connecting rooms. Will there be an indication if the room connects to another on this site? Or could that be included as a filter? Thanks Maureen! I believe we either have connecting-room information or we can get it. Let me check. All I can say is, Wow! You guys are amazing. Thanks for all you do! Wow!!! Len this is amazing! Great work to you and the team. This site and the whole TouringPlans on line service (including crowd calendar and apps etc) has really improved by leaps and bounds over the past few years. I am very very happy to support it’s continued development with my subscription and feel the value has increased 10 fold over he years! This is outstanding. Thanks for all your hard work. Fantastic Idea! Eagerly awaiting Contempo being added. Needs some way to find a specific room number in the map? I see how you’ve optimized user flow around people just looking for a room, but if you already know your room number (e.g. from Checkin) it’s very difficult to find where that would be in the map. A free-text search by room number could be a simple way to pull that off. Hey Matt – thanks for the suggestion. That’s a good idea. Let me see what we can do after we get all of the hotels up. Do we have views for BLT yet? I have been looking and I can not find it. I posted on another thread too, but maybe this “main” thread will be more visible – I’m looking for Boardwalk Inn.